A massive great white shark got a little too close for comfort last month as it circled a police boat on patrol off the coast of Australia. 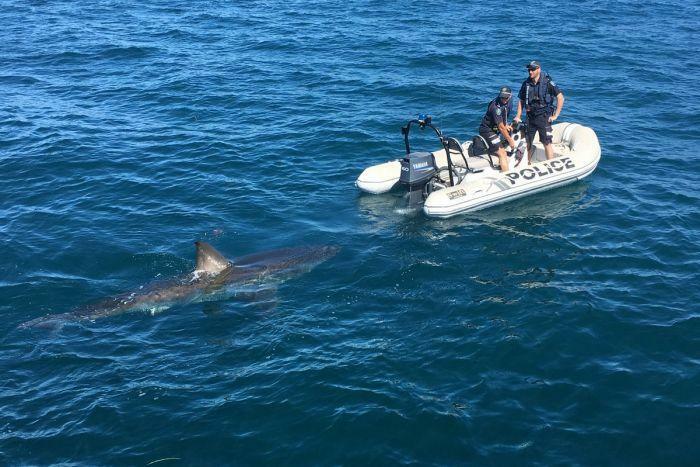 South Australia Police were doing rounds on recreational boats at Tapley Shoal, nine nautical miles east of Edithburgh, when the shark swam up between the police dinghy and a small boat they had targeted for inspection. One of the men on the fishing boat told Australia's ABC Radio they were trying to get away from the beast when police pulled them over. Mark Oats said he and some friends were drift fishing in the area, when his friend suddenly swore and shouted: "Look at the size of this thing that's come up behind us!" Oats told ABC Radio the shark was about "4.5 to 5 meters" (about 15 or 16 feet) long and became interested in their slightly bigger fishing boat before setting its sights on the police officers. "I told the boys to back off a bit because the shark was right next to us," Oats said. "For probably the next 10 or 15 minutes we just sat around." The officers were stopping random boaters, checking registration, licenses and safety equipment, as well as testing for alcohol and drugs, when they encountered the shark. The great white, dubbed "Noah" by the officers, passed by the dinghy without incident -- though police said in a Facebook post he "wasn't keen" on being breath-tested, and the officers "were happy to oblige."